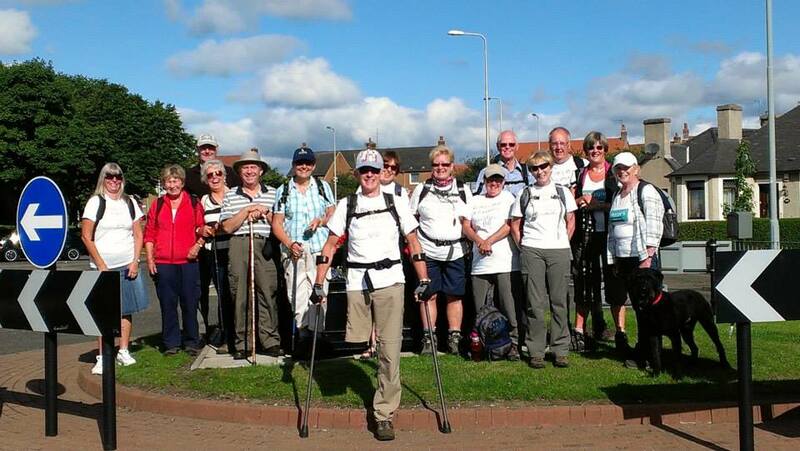 Day 4 – Tuesday 6th August 2013. Buckhaven to Earlsferry. Fife’s coastline at its most beautiful & beguiling. Allan Crow looks back on a wonderful day of walking amid some of the Kingdom’s most wonderful natural scenery. Standing at the railings overlooking Fife Energy Park in Leven early this morning, we could see our destination away in the distance. We could scan round to our left and see the distant tip of the land jutting into the blue sea – Earlsferry, some 12.5 miles away. Several hours later we could look back at the wind turbine which was now but a speck on the horizon after a fabulous day of walking – quite possibly, the best yet on Bob’s Walk. Day four was blessed with glorious weather and showcased Fife Coastal Path at its most breath-taking. The views were stunning – from the blue/green sea to the gentle lapping of the waves on the sand which acted as a metronome as we marched along the beach for mile after mile, to the tops of the cliffs as we looked back on Shell Bay. Onvce again we were delighted to welcome some familiar faces back, and some new recruits – members of Glenrothes Ramblers joined us. Or, ‘Glenrothes Gamblers’ as my Twitter update very nearly said thanks to the ‘joys’ of predictive texting! The car park of the Buck & Hind pub was more or less filled with our cars as we set off to collect the rest of the team, and stage a photo-call on the centre of a roundabout in the middle of a junction which was, thankfully, quiet at that time of the morning. The first donation of the day came within minutes – our sincere thanks to the driver who stopped to hand over some cash. Walker Bert Hannah brought the history and industrial heritage of Leven to life, pointing out landmarks and historical links – I never knew that the Swan Hotel featured in the classic drama ‘‘Tutti Frutti’ – as we headed past Leven Swimming Pool. From there it was on to the Prom and along the front en route to Lower Largo during which time we enjoyed long stretches walking on the beach as well as along narrow paths. The sea breeze was perfect for keeping us cool as we logged the miles before stopping for a wonderful BBQ courtesy of Mairead Stewart. Mairead walked with us on day three from Burntisland to Buckhaven, and very kindly invited the walkers to dine alfresco with food courtesy of Stewart’s of Lower Largo, and delicious strawberries from Blacketyside. Our thanks to both companies for their generous donations. Tu Edwards, community fundraiser from Maggie’s Fife, joined us for the BBQ which was superb – wonderful food, excellent company and a fabulous host – and which set us up for the afternoon leg up to Earlsferry. We followed the old railway line and the beach to Dumbarnie Links before heading up to Shell Bay where perhaps the finest views of the afternoon lay ahead of us. More than once we simply stopped to look across the Forth which was as calm as a pond – the flare of Mossmorran was one of the view signs of movement on an otherwise still, and perfect, landscape. Climbing higher up the grassy hills and with the Chain Walk below us, Earlsferry spread out before us – the perfectly maintained golf course skirted by a golden beach and ringed by immaculately tended houses. With the old gun turrets at our backs, it was a perfect photo opportunity; a chance to show people why Fife’s coastline can be beguiling, and never ceases to delight. 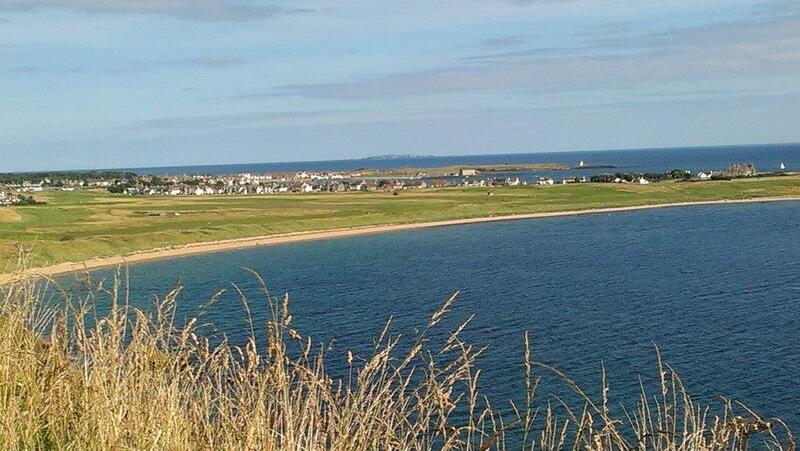 Day 5 (Wednesday) Bob’s Walk heads from Earlsferry to Crail. We leave Earlsferry Golf Club at 9.30 a.m. and will follow the coastal path to Elie and St Monans before heading on to Pittenweem where a Maggie’s pop-up centre will be placed as part of the town’s arts festival. Please come and say hello or take the opportunity to find out more about the work Maggie’s does. We then head on to Anstruther and arrive in Crail around 4.15 p.m. If you’d like to join any part of the walk please you will be made very welcome. Please visit www.bobswalk.co.uk for further details.